You’ve probably heard a lot of Shakeology success stories by now. This superfood health shake has already helped thousands of people just like you with their health. Here are the top 5 benefits of drinking Shakeology every single day! “I FEEL HEALTHIER!” – 93% of Shakeology users felt healthier since drinking it. “SHAKEOLOGY CURBED MY CRAVINGS!” – 81% felt it helped them reduce their cravings for junk food. “IT HELPED GIVE ME MORE ENERGY!” – 86% experienced an increase in their energy levels. “SHAKEOLOGY HELPED IMPROVE MY DIGESTION!” – 82% of Shakeology users reported improved digestion. “I SPENT WISELY!” – 97% felt Shakeology was a smart investment in their health. After drinking Shakeology for over 5 years, I can tell you that I initially lost 10 pounds and my energy levels increased. My energy continues to stay high and the weight stayed off! Plus I don’t need to take vitamins anymore! I want to share with you some other success stories. But to really understand how Shakeology can help you, try it for yourself! CLICK HERE to order Shakeology. For years, Linda woke up tired regardless of how much sleep she got. When she reached 60 years, she felt really old. So she tried Shakeology and got her “old self” back. She has lost 45 pounds and has lots more energy to exercise. Kory was a non-breakfast guy who is now addicted to Shakeology! What do you do when you don’t like breakfast, are always on the go, but still need to eat? Kory’s solution is Shakeology. Nowadays, he drinks one before his P90X workout and it gives him the energy needed to power through the day! During her first month of doing the P90X workout, Ileana drank “a different” shake! Then she tried Shakeology and it was like night and day. Her exercise results amplified nd she lost her sweet tooth. She didn’t even need her shelf full of vitamins anymore. 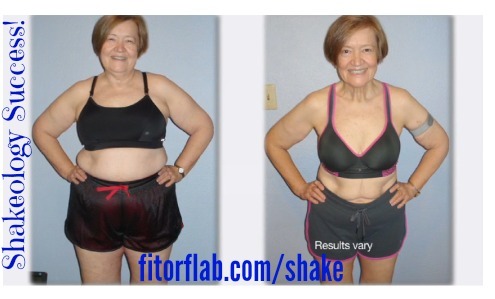 Shakeology provided everything she needed. Shakeology really works! These are just a few of the thousands of Shakeology success stories. YOU can have a Shakeology success story too. CLICK HERE to order yours today!